Vibrant images make the difference between your content getting seen and shared or ignored. If you want influencers with thousands of followers to notice what you share, you need big, bright colors and unique visual content. In order to get readers or customers, you first must get their attention. Text alone won’t do it. Images that are boring stock photos won’t either. What works for a corporate brochure is too boring to grab attention on social media. Every piece of content you create needs at least one compelling image. It doesn’t hurt to also include a video, a SlideShare, or an infographic. Some long form content will contain a combination of these or even one of each! Basically, you can either take photographs yourself, make images using something like Canva, find them free online, or buy them from a stock company. Some time ago I compiled 43+ Free Blog Images Sources: Where to Get Royalty Free Photos. Watch the video below as I show you what social media looks like when you follow almost 60,000 people. It should become obvious what catches the eye. What gets me to stop is very similar to what will get someone scrolling through content on their smart phone to pause. Just having visuals in your content isn’t enough. Pushing them out full size to social networks on a regular basis is essential. While this can be done manually, if you’re serious about getting traffic and growing your influence it is time to consider using a tool. The beauty of MavSocial – my favorite new solution for pushing images to social media – is that you can use it for free if you only have a couple social networks. Most of us need more than that, but MavSocial has a very reasonable pro version. What you save in buying images from stock companies will more than pay for it. The best size images for blogs is full width of your content. On this blog that is 590 wide. Most blogs are between 560 and 640. That means 2 credits per image on most photo sites making each image $2. If you use 15 images a month, the $30 you save will pay for the pro version of MavSocial. When pushing images through MavSocial, they appear on Twitter and Facebook full size. These get more attention than the images pulled using Twitter Cards. They look identical to images uploaded manually on the social networks. The first step to getting the most value from using MavSocial is to add compelling images and videos to all of your content. Go back and add them to existing pillar content you want to promote regularly and start adding them consistently to your new content. Pushing videos through MavSocial is particularly valuable because they are organically added. Facebook favors videos manually loaded or pushed through MavSocial. The video above shows how to use MavSocial. It is the easiest social media management tool I’ve seen to use and learn. Try it out for free by going to MavSocial.com. In SEO work the traffic is very important, in that social media plays a vital role. Social media provides links, but they don’t last for a long time. They seem to be temporary. The key thing social does is get your content in front of more people so that it has a better chance of attracting incoming links that are more permanent. Thanks for sharing such a resource intense post Gail! But just as you pointed out, whenever I’m online, cruising social media, a really good visual, definitely catches my attention! And causes me to pay more attention!Thanks! Thanks for taking the time to comment. I’ve done a couple videos showing how I scroll through my Twitter stream and which images grab my attention and how text rarely does. It definitely makes a HUGE difference to use compelling images. Hey Gail, & Andrij I had to comment since it’s rare that I agree with the pros and cons in one article. People that know me, understand “depends” is my go to answer until I can really sink my teeth into the puzzle/strategy as it were. But after reading the comments I wanted to join in the conversation! Whichever direction one chooses there’s always an end goal… thus both of your approaches would work. While I can appreciate being and having a refined followers list (quality versus quantity) there’s a lot to be said for quantity versus quality. At the end of either “Tactics” approach there will be something to measure. What I’ve learned in my years on Twitter is, we are dealing more and more with an instant gratification society. We have a very limited time line to make an impact. Therefore, the long term relationships aren’t as sought after as the fast, visual eye candy and social power based on numbers. Ultimately it’s a matter of choice, voice, message and brand. Ask yourself what are you aiming for…and work around those parameters. KPI’s are you best friend! Thanks for weighing in on this. I actually agree with Andrij for most businesses. As Twitter influencers, we use Twitter very differently than I do when I manage an account for a business. If someone asked me for advice, I would recommend they focus on relevant followeres and deeper relationships instead of trying to become an influencer with tens of thousands of followers. What matters is the interactions. Even among influencers there are different ways of using Twitter. I follow a lot of people, feed a lot of top content and participate in Twitter chats. Many other influencers follow very few people and primarily interact with others with high Klout scores. Feeding a lot of content reduces your Klout score, but increases your visibility – it is a trade-off and a decision each person has to make for themselves based on their goals. 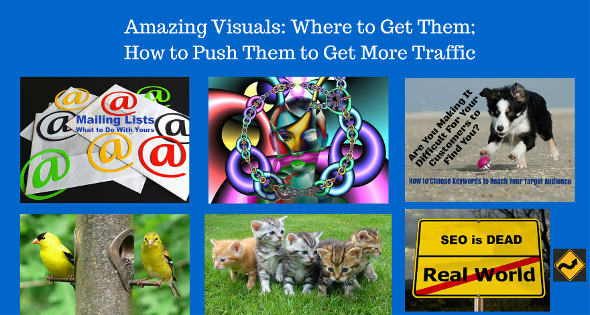 Thanks Gail, Another amazing post I am definitely going to use some of these resources to make my future work more visual. For ease of finding and getting awesome media into content, I haven’t seen anything as efficient as MavSocial. For someone who doesn’t know which license to choose or size to pick or how to resize, this is pure genius. Just add to cart, checkout, and there the image is in just the right size and resolution for social media. If you choose the free images you can also use them in your content. Thanks For SEO Article. it is Very Useful Work. I Have Started SEO Work. But Social Media Is very Importent. I will use Trick For Get Best Traffic . Flickr all day. Set the search to find Creative commons attribution licenses and I go to work. Or I shoot my own! Clients like the personal touch, and my pics are often better than any free or cheap stuff I can find for mundane subjects. Yea I will have to second creative commons on flickr as well. Very easy to use and there is a great selection nowadays. Of course shooting your own stuff is preferred. Nice post and informative too. Visual content performs much better than descriptive text content, but the quality of visual is also plays a role. Eye catching things will never fail. It appears to me that many still don’t understand how much easier it is to promote content and get attention when there is at least one and preferably more than one compelling image in it. Thanks for explaining your ideas with us! Its really helped.I am very thankful to have found your blog!you can also read my blog very usefull for every1..related topic Technology, Gadgets, Apps, Games etc. Hi,Them selection is an important task for drive traffic in our blog.Them is important to show peoples what is about our blog.It helped me for select Images to social media.I like to see some other informative post from this site.Thanks for your suggestion. I am updating the post right now to indicate that the FREE images in MavSocial are ok to use on your blog, but the ones you buy are NOT under the providers’ licensing. Serious bloggers with very large followings use these two sites regularly. When I’m really “on” I use them every day for all the best content I write and publish. Great information. It help me alot. I’m just a newbie in this industry. Traffic always be the most difficult problem for newbie beside SEO. I have to learn alot from many website like you. Thanks! Also consider using TrenDemon. I wrote about why here: Increase Website Traffic Automatically Using Your Own Best Content. I think the true lesson here is that we shouldn’t be “following” 60,000 people on social media. That is absolutely crazy and destroys a home stream. Follow people if you have intent to interact with their posts, rather than just as a following “strategy” on Twitter. Thank you for taking the time to comment. There are many ways to use Twitter. For most people, it is better to develop a more targeted following and build closer relationships. That would be true especially for local businesses. But there is a reason that brands seek out influencers with tens of thousands of followers or more. They can bring more visibility. If I had fewer followers it is highly likely you would not have seen this and be commenting on this post now. Some of us are big picture generalists. We rely on lists to interact with as you do your home stream. We use the river that is our home streams to curate the best content for those who follow us. For building relationships and converting, smaller numbers work best – but if you want reach on any scale a large following is necessary. Honestly? Seeing that you follow almost the same number of people that follow you – and the little engagement compared to the follower count is actually a bad sign. I can also follow 60,000 people that followback and get 60,000 followers. But I’d have just as little engagement on the network. Engagement is a matter of time and access. Most of the influencers I know on Twitter I have direct contact with on Skype. We tend to use that instead as it is faster than waiting to see a tweet. We also are connected on Facebook, LinkedIn, Pinterest, Google Plus, and in groups and communities on multiple platforms. All engagement is not publicly visible. What matters is results.